Commentary on "The Gospel Comes to Thessalonica"
Today, the student is asked to read Acts 16:9-40 which covers the period of time when Paul and Silas where preaching in Philippi and asks us to explain in our own words why the people reacted negatively to the gospel message. Soon after Lydia and her household respond to the gospel message and join the Kingdom of God we come to the account of the slave girl who brings her master much profit through her demonic power of divination. What happens next is the subject of today’s lesson and why those who preach the gospel message must have the courage and willingness to face persecution and even be willing to be martyred for their faith. While Paul does pay a severe price for his role of being an Apostle to the Gentiles it should be kept in mind that all Christians can expect some form of persecution for their faith. When this occurs in your life keep in mind who your real enemy is. Since one of the themes Paul addresses in these two epistles is that the Thessalonians were paying a severe price for having turned away from their idolatrous ways it is odd that today’s Quarterly lesson doesn’t make some reference to this. 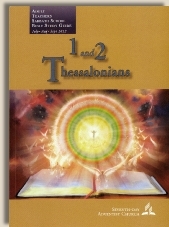 In the Quarterly lesson it says that Paul and Silas “boldly entered the synagogue at Thessalonica”. Reference to this implies that what happened in Philippi has something to do with their preaching to the Jew’s in their synagogue which is not the case. Philippi was a Roman colony ruled by Gentiles. And it was the loss of income by a Gentile that precipitated their being beaten and thrown in jail. Casting out a demon, not their preaching to Jews in the synagogue, precipitated the riot that ensued. Our true enemy can attack in many ways. This can often be in an indirect or unsuspected way rather than a 'head on’ confrontation. This was the case in Philippi. Many were responding to the gospel message. Only when a certain person’s mode of earning a living was threatened did the city riot, beat and put Paul and Silas in jail. What we do learn from this account in Philippi is that Paul was fully assured that Satan’s ambushes will lead to God’s 'checkmate’. When Paul and his co-workers left Philippi they left victorious praising the power of God. The one thing the Apostle Paul valued above all else was “the surpassing worth of knowing Christ Jesus my Lord”. In comparison to that knowledge all that he suffered was nothing more than mere “rubbish”. While Paul certainly can be said to have suffered at the hands of his fellow Jews this wasn’t the case in Philippi. The overall record does shows that he suffered most concerning his fellow Jews by their rejection of the gospel message of Jesus Christ. Like the Thessalonian Body of Christ, Christians in all places and in all ages can expect similar sufferings and persecutions. Just don’t forget who your real enemy is and make sure what you are suffering is for the real gospel message wearing the full armor of God. Copyright 2012 BibleStudiesForAdventists.com. All rights reserved. Revised June 26, 2012. This website is published by Life Assurance Ministries, Camp Verde, Arizona, USA, the publisher of Proclamation! Magazine. Contact email: BibleStudiesForAdventists@gmail.com.